Enjoy some incredible savings by experiencing our Derby City Combo pass. 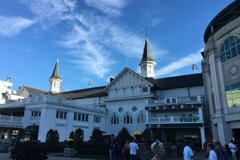 With this pass you will be able to visit Copper and King Distillery and the Kentucky Derby Museum, which includes a tour of the world famous Churchill Downs Racetrack. This Derby City Combo Pass is valid for one general admission into each location and will allow you to experience both places while in town. **The Voucher will have the distillery tour times and museum operation hours to follow and maximize your time. Please view the times in the voucher. Discover how some incredible bourbon is created and distilled by visiting Copper and Kings Distillery and also spend time at the Kentucky Derby Museum with the same pass. You will get an exciting experience with our Derby City Combo Pass as well as enjoy some incredible savings since this pass is valid for One Admission into each location and will allow you to experience all both places while in town. You can start at either place but make sure you look at the Tour Times offered for the Distillery and the operation hours for the Kentucky Derby Museum. Cooper and Kings Distillery: Produces delicious American Spirits including Brandy, Apple Brandies and a variety of Vapor Distilled Absinthe. Our knowledgeable distillery tour includes a walk through our modern, Eco friendly facility including the Courtyard, with fire pit and reflecting pool, You will experience the Distillery floor, Maturation Cellar, and finishes with an exclusive tasting in the Art Gallery. Kentucky Derby Museum: Where every day is Derby day! When you visit the Museum, you will find yourself immersed in the next best thing to actually being at the Derby! Our exhibits will take you through the journey from the birth of the foal to the winner's circle or you can take in the view of the track from the middle of the Infield. We are the exclusive tour provider for Churchill Downs Racetrack!